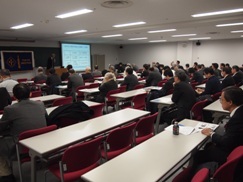 The 2012 11th Lecture of Tokyo Section was held with 61 participants on Monday, November 26, 2012, from 4:30 p.m. at Kenshu 1 on the 3rd basement floor of Japan Society for the Promotion of Machine Industry. The lecturer was Dr. Akira Yoshino with Asahi Kasei Corporate, the recipient of the 2012 IEEE Medal for Environmental and Safety Technologies. Dr. Yoshino gave a lecture entitled "Course of development of lithium ion battery and future outlook". He first explained the story of success in the development of lithium ion battery, and then talked about his experiences to set the technologies up in business, finally presented audience his future prospects of the battery industry. The lecture was succeeded with quite active Q&A from the audience. 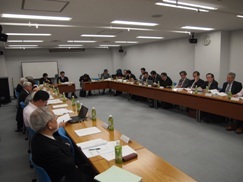 The 2012 Fourth Meeting of Tokyo Section Executive Committee was held on Wednesday, December 5, from 3:00 p.m. at Kikai Shinko Kaikan Building, Tokyo. Long Range Strategy Committee (LRSC) was held on August 31th and September 28th in FUJITSU head quarter building. LRSC is an ad hoc committee of IEEE Japan Council (JC), which discusses mid/long-term task. On the first meeting, we discussed more the transition from JC Chapters to Sections, which we have discussed since last year. LRSC continues to discuss it to summarize on the Third JC Executive Committee, in cooperation with IEEE Japan Council Chapter Operations Committee. On the second meeting, we discussed "a capable budget planning of appreciating yen" which was raised on the Second JC Executive Committee on July 27th, and made a budget draft. The result of study will be reported on the Third JC Executive Committee on December 18th. 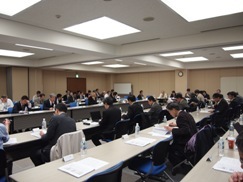 The 2012 Second Meeting of Japan Council Chapter Operations Committee was held on Thursday, November 29, 2012, from 2:00 p.m. at Kikai Shinko Kaikan Building. 2012 Student Branch Leadership Training Workshop (SBLTW) was held at Meiji University on December 15, 2012. 71 members, including 48 students from 22 out of 25 universities which have each Student Branch (SB) were participated. This year, Chuo University and Tokyo University of Agriculture and Technology have established their Student Branches and their representatives join this workshop. The SBLTW was moderated by JC SAC Chair, Professor Tetsushi Ikegami of Meiji University, and Meiji University SB Chair, Mr. Hiroki Katsuta, and began with the self-introduction of JC SAC members. Then, Region 10 Student Activities Coordinator/Trainer, Professor Onoye of Osaka University, lectured about IEEE overview and IEEE Student Branch administration. 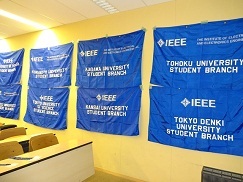 After the lecture, the Tokyo Young Researchers Workshop (TYRW） 2012 held in November, was reported, and all the participants introduced themselves and each Student Branch reported their original activities. On the afternoon session, the introduction of R10 Humanitarian Technology Conference (HTC) 2013 was given by the IEEE Tokyo Section Vice Chair Dr. Hirohisa Gambe of FUJITSU LIMITED. Then students worked on the group work program led by the Meiji University SB. The theme of the group work this year was "Trade Game". Students divided into eight groups (nations) trade their unequal resources (money, paper and stationery) to produce commodities (paper of the designated shape) and accumulate their wealth. After the game they enjoyed their presentations of strategies and outcomes of eight nations with their results of leadership training. Memorial plaque was given to SB of Kagawa University for the tenth anniversary celebration. Next year, SBLTW will be held in conjunction with R10 HTC2013 at Tohoku University (Sendai) in August. Ø If you would like to establish a Student Branch in your University or know the detail of the activity, please click here. 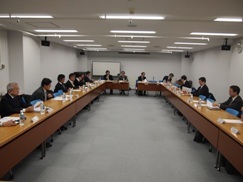 The 2012 Third Meeting of Japan Council Executive Committee was held on Tuesday, December 18, 2012, from 3:00 p.m. at Kikai Shinko Kaikan Building, Tokyo. Have you renewed your 2013 IEEE membership? You can easily renew your membership online with your Web Account.